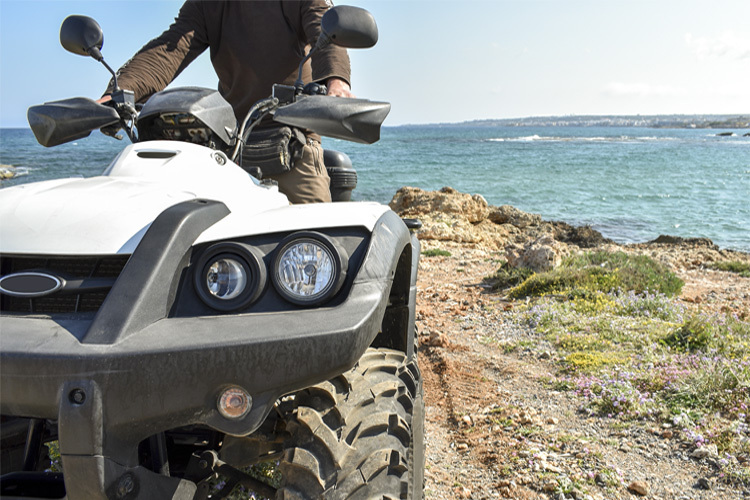 These new pickups are fuel efficient, powerful and perfect for outdoor adventuring. It’s a great time to be in the market for a new pickup truck, especially for those who love the outdoors. All three Detroit makers have introduced (or are about to unveil) brand-new versions of their half-ton pickups that are more capable and technologically sophisticated than ever before. And all are great choices for outdoor enthusiasts who want to head off road, pull a trailer or haul the entire family (and their gear) in comfort. Two forces are driving the unprecedented levels of high-tech equipment on pickups these days. One is the constant need to improve fuel economy, which has resulted in powertrain options that range from highly efficient V6 engines to small-displacement diesels and mild hybrid systems. The quest for more miles per gallon has also put these new trucks on a serious weight-loss program. Replacing certain steel components with those made from aluminum and composite materials has shaved off hundreds of pounds, making it easier for those smaller engines to do the work required of a truck without guzzling fuel. 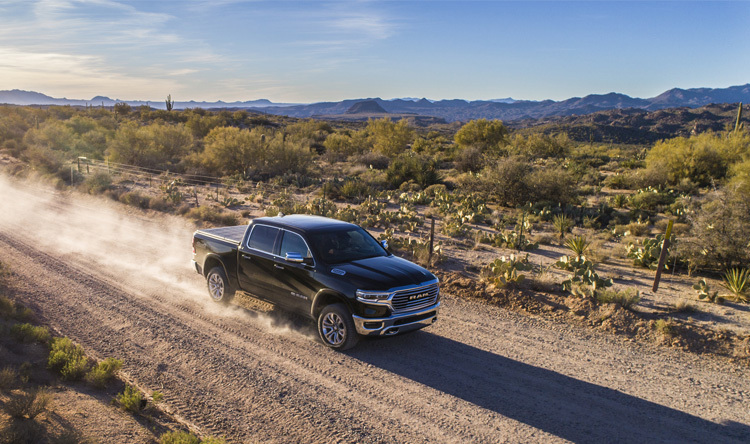 The second tech trend at play these days is the need for pickups to offer the same safety features and connectivity systems available on mainstream sedans. Backup cameras are standard equipment; and options, like adaptive cruise control, blind-spot monitoring and lane minders, once offered only on premium cars, are now widely available in trucks. So are Apple and Android device compatibility, tablet-like touchscreens, and the ability to turn your truck into a rolling Wi-Fi hotspot. 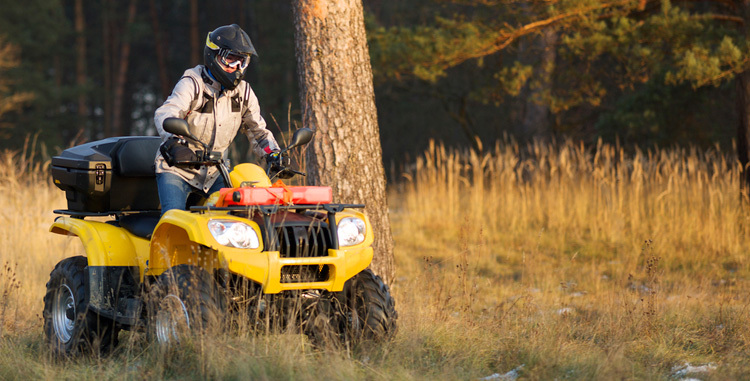 This guide, though, is less about infotainment and more about what’s necessary for outdoor adventure: power output, towing capacity, off-roading equipment, and so on. Today’s trucks are remarkably capable right off the showroom floor, with suspension lifts, meaty tires, locking differentials and other gear that used to be available only through the aftermarket. Read on to discover what Ford, General Motors and Ram have to offer for outdoors enthusiasts looking for a new pickup. Ford was first to market with a weight reduction program in 2015. 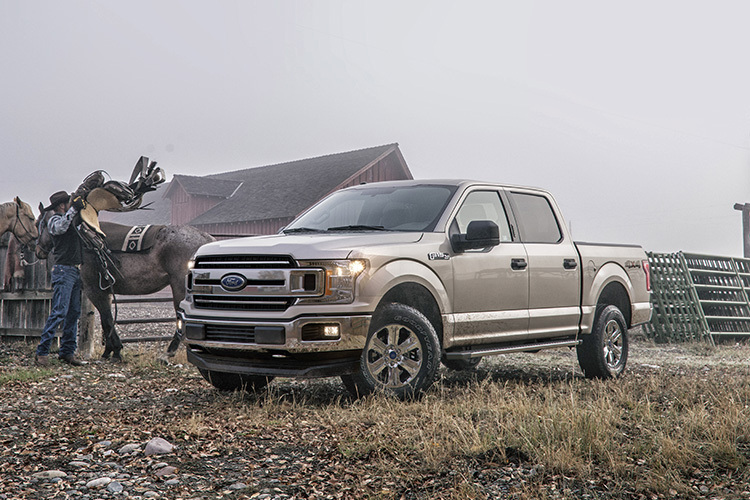 Extensive use of aluminum throughout the F-150’s body trimmed some 700 pounds from its overall weight, a savings that Ford reinvested in the truck’s payload and towing capacities. Ordered with the right equipment, a 2018 F-150 4x2 can tow up to 13,200 pounds and haul 3,270 pounds. That 2015 redesign has been freshened for 2018 with what Ford calls a “chamfered” look to the truck’s body, its edges rounded off for aerodynamic efficiency. The F-150 is offered in seven different trim levels, from base XL to the desert-race-ready Raptor and the top-line Limited model. Among the six engines available is a new 3.0-liter Power Stroke V6 turbodiesel. Designed by the same team that engineered the 6.7-liter Power Stroke V8 for Ford’s Super Duty pickups, the V6 diesel produces 250 horsepower and 440 foot-pounds of torque, with the torque peaking at a low 1,750 rpm. Ford’s goal of 30-mpg highway fuel economy leapfrogs the mid-20-mpg numbers returned by the gas engines, while the diesel’s towing and hauling capacities come in at 11,400 and 2,020 pounds, respectively. The five gasoline engines available in the F-150 include four V6s and one V8, all incorporating auto stop/start technology. The base 3.3-liter, 290-horsepower V6 is backed by a six-speed automatic transmission, while the three EcoBoost V6s and 5.0-liter V8 are mated to 10-speed automatics equipped with selectable driver modes. The EcoBoost V6 engines are the most advanced in Ford’s fleet, using turbochargers, direct and port fuel-injection systems and other engineering to squeeze considerable power from small-displacement blocks. The high-output 3.5-liter EcoBoost V6 in the Raptor, for instance, makes more power and torque (450/510) than the 5.0-liter V8 (395/400). Those who tow will want to look into the Max Tow Package, which includes the innovative Pro Trailer Backup Assist system. With it the driver controls the direction of the trailer while backing up by using a dashboard-mounted knob. A mainstay of Ford’s truck lineup in the 1980s and 1990s, the compact Ranger pickup, was discontinued in the U.S. after 2011 while remaining on sale in other parts of the world. 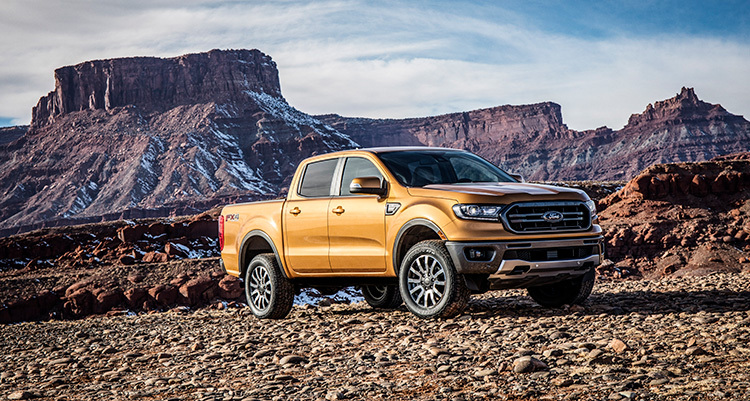 After watching Toyota and Chevrolet make hay in the midsize truck segment in recent years—sales are up 83 percent since 2014—Ford decided to bring the Ranger back to the U.S. for the 2019 model year. Production will start in late 2018 on a truck that will be available in SuperCab and SuperCrew body styles, in 4x2 and 4x4 versions, and in XL, XLT and Lariat trim levels. One powertrain will be offered: a 2.3-liter EcoBoost four-cylinder backed by a 10-speed automatic transmission. Ford hasn’t yet released output figures for the Ranger’s EcoBoost, but that engine in a Mustang makes up to 310 horsepower and 350 foot-pounds of torque, numbers we could only dream of during the Ranger’s earlier years. 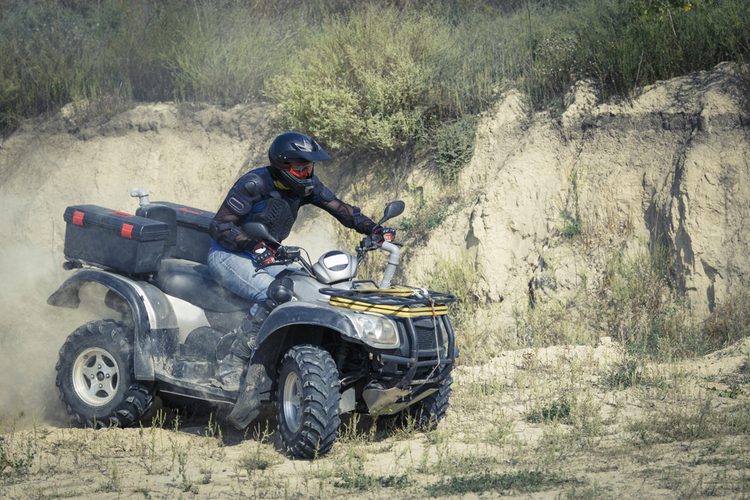 The new Ranger’s optional FX4 Off-Road Package is far more functional than some sticker-and-badge packages we’ve seen. In addition to all-terrain tires, tuned shock absorbers and skid plates, the FX4 package includes a Terrain Management System (like the Raptor’s) with selectable driving modes that will alter throttle response, transmission gearing and other powertrain operations to suit conditions like mud, snow and sand. Ford’s Trail-Control system is also part of the package. When engaged the driver can set a speed—much like cruise control—and then focus on reading the trail and steering while the truck automatically controls the throttle and brake. An electronic-locking rear axle will also be available. Quick tip: No Hassle, No Haggle Truck Purchases Want to buy a new truck but don’t want to go through what could be a stressful negotiating process at the dealership? See if your local dealer has an internet sales department. Almost all of the buying process—short of a test drive, of course—can be done online. Often the internet vehicle prices are already marked down, since online sales cost the dealer less. 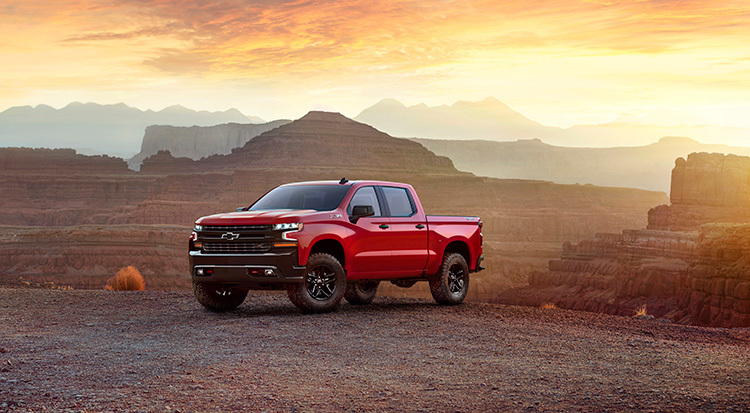 Chevrolet celebrates 100 years in the truck business in 2018, and is marking the anniversary with all-new 2019 Silverado pickup trucks going on sale this fall. (Sister brand GMC is introducing all-new 2019 Sierra pickups in the fall, too.) The restyled trucks are larger and look brawnier than previous versions but are lighter as well, thanks to the use of what Chevrolet calls “mixed materials” in their construction. Truck bodies are made up of both steel (fenders, roof, bed) and aluminum (doors, hood, tailgate), while certain chassis components are now made of forged aluminum rather than steel. Chevy figures the weight saved can add up to some 450 pounds in crew cab models. Enlarging the truck’s dimensions included making the cargo box bigger. The bed floor is now nearly 7 inches wider, bringing total volume of the short box up to 63 cubic feet. Chevrolet has also made the floor stronger with a higher grade of steel and has equipped the box with 12 fixed and 9 moveable tie-down points for greater flexibility when securing cargo. Six engine/transmission combinations will be offered in the Silverado. The 5.3- and 6.2-liter V8s have been up-fitted with Dynamic Fuel Management systems that can shut down any number of cylinders, depending on engine load, to improve fuel economy. Chevrolet will also add a second diesel engine to the mix, as a 3.0-liter inline-six Duramax turbodiesel joins the 6.2-liter V-8 diesel. No power output numbers have been offered for the new engines, so we are still waiting to hear about the new truck’s tow and payload capacities. The Silverado will be offered in eight trim levels, ranging from the base Work Truck to the premium High Country version. Outdoor enthusiasts will likely be drawn to the Trailboss models, which upgrade Chevrolet’s traditional Z71 off-road package with a 2-inch suspension lift, Rancho shocks, a locking rear differential, skid plates, and Goodyear DuraTrac tires on 18-inch wheels. 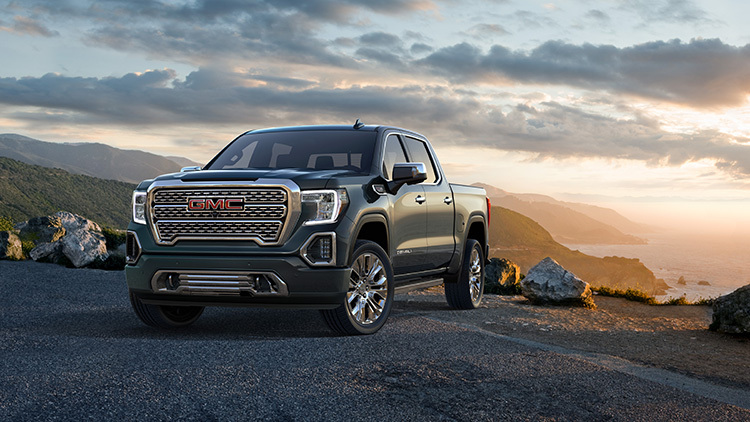 Similar changes and upgrades appear on GMC’s 2019 Sierra models, though there is equipment exclusive to the brand. The high-end Sierra Denali is available with the CarbonPro, a cargo box built with steel outer fenders and carbon fiber inner fenders and floor. The CarbonPro box can be paired with the MultiPro tailgate, a really handy piece of equipment with a hinged top half that can be configured to provide everything from easier access to cargo to a flat workspace, a second loading tier, even a step up into the box. Quick tip: When considering a new truck purchase, take advantage of the buying power you have through your membership in certain organizations. The Auto Club (AAA) has a well-known car buying program, but so do credit unions, college alumni associations, even the AARP. 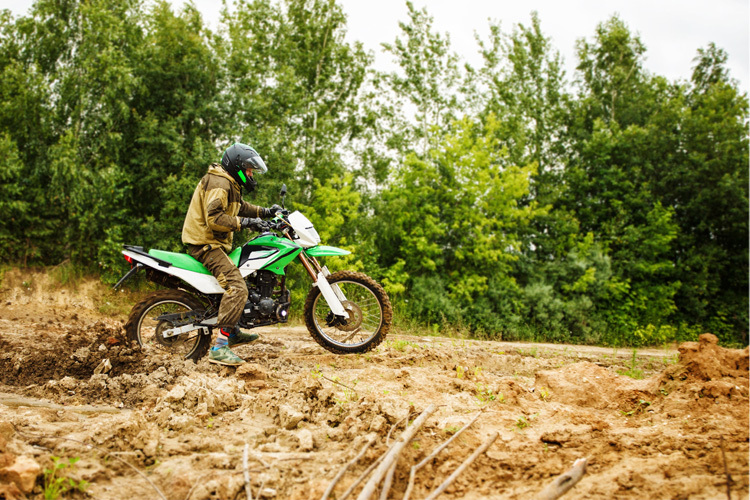 If you’re a member of the military, most dealers offer discounts or cash-back programs for veterans as well as active-duty members. For years, Ram set its pickups apart from other trucks in the market, styling-wise, with its signature “crosshair” grille. The redesigned 2019 Ram 1500, available for order now, loses that design cue. Yet stylists worked hard to render a new grille shape that would look familiar across the truck’s six models and yet could be differentiated enough so that each version had its own identity. Differentiation is a hallmark of the Ram brand. Ram 1500s are the only pickups in the segment to use rear coil springs rather than traditional leaf springs, a move that improves the truck’s handling while maintaining high carrying and hauling capacities. And while all three makers have honed their trucks’ aerodynamic profiles for better mileage, Ram takes air management technology further with active air shutters in the grille, an automatic front air dam that deploys at speeds above 35 mph, and an optional air suspension that automatically lowers the truck at highway speeds. The 2019 Rams are longer than previous models, yet the use of lightweight aluminum and composite materials throughout the truck’s body and chassis have cut 225 pounds from its overall weight. 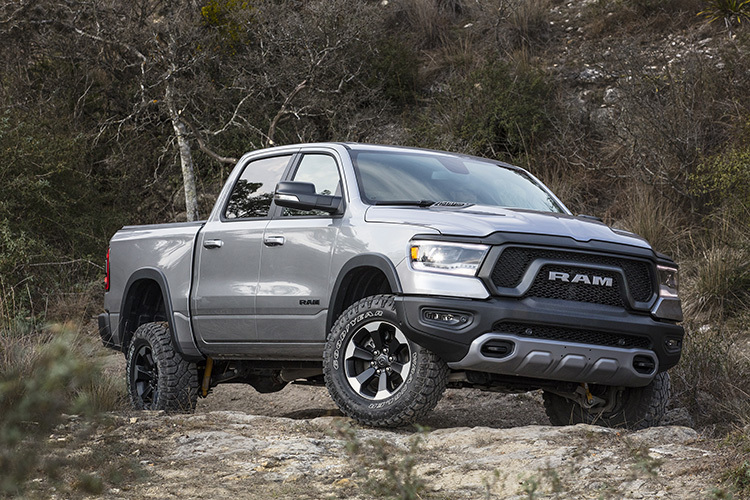 That weight loss, combined with improvements to the Ram’s frame, have increased its maximum tow and payload capacities to 12,750 and 2,300 pounds respectively—significant increases over the 2018 models. The Ram is still available with the 3.6-liter Pentastar V6 and 5.7-liter Hemi V8 engines, but both are now fitted with a mild hybrid system called eTorque. (A non-hybrid Hemi is also available.) The eTorque system replaces the alternator with a belt-driven motor generator to enable start/stop technology and brake energy regeneration to improve fuel economy, while also providing short bursts of supplemental torque to the engine’s crankshaft under certain driving conditions. Power ratings for the eTorque versions of the engines remain unchanged: The V6 makes 305 horsepower and 269 foot-pounds of torque, the Hemi V8 395 horsepower and 410 foot-pounds. But the battery supplies 90 foot-pounds of launch torque to the V6, 130 to the V8. All three engines are backed by eight-speed automatic transmissions. Ram offers a new 4x4 Off-road Package for 2019 that’s available in nearly every 1500 trim level. 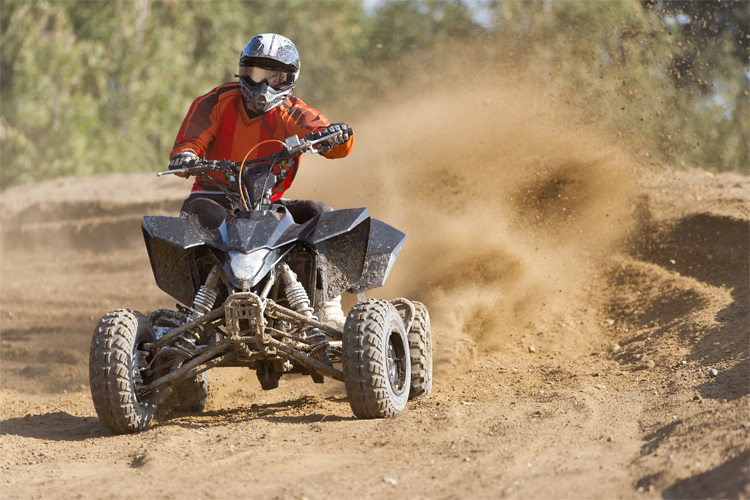 It includes a 1-inch suspension lift (with or without the optional air suspension), specially tuned shock absorbers, Hill Descent Control, an electronic-locking rear differential, and 32-inch tires on 18- or optional 20-inch wheels. The Rebel, Ram’s off-road-tuned model, has many of the Off-road Package features along with 33-inch Goodyear DuraTrac tires and Bilstein remote-reservoir shocks. For 2019 the Rebel is available in both Quad Cab and Crew Cab body styles.